Shawn Yue and Miriam Yeung reprise their popular roles as Jimmy and Cherie in this third instalment of the romantic comedy Love in a Puff. I vaguely recalled watching these 2 actors on a movie before, but it had never interest me as Miriam Yeung and Daniel Wu had always been one of my top all-time on-screen couple for over a decade. Thanks to Clover Films, I got a chance to catch the third instalment of the trilogy and I was surprised how easily it was, for me to relate and feel for the characters even when I haven’t watched the previous 2. Peps Goh: The visuals was one that stood out to me just a minute into the movie. This whole film seems to be shot almost entirely on a tilt shift lens, bestowing it a dreamy yet peculiarly immersive feeling. And it is surprising to me how a lens initially designed to shoot architecture can be utilised to reel these characters in and create a more relatable aesthetic, pulling them closer and sharper into focus for the audience. That, and how they presented the HongKong cityscape in a perspective that is rarely done, and with it, the establishing shots that would otherwise be passé, over-done and pretty much lazy film making, is turned into fresh and pleasant treats to the eyes. Tiffany Yong: The “out-of-the-world” UFO observations and the outlandish singings aside, the movie is a heartfelt piece of work (without comparing with the previous works). The insecurities, tiffs and disagreements were very relevant, and given that I am currently in a similar relationship as Jimmy and Cherie, it felt almost as if the director was forecasting a potential future I might be facing. The worries and self-doubts are all so real that I got sucked into Cherie’s emotions in a short time. Tiffany Yong: Audience familiar with the Hong Kong entertainment industry will see many interesting cameos, from taxi-driver, to hair stylist or even passer-by. The writer-director threw different obstacles in the way of the couple and it was introspective to watch how they viewed and dealt with each problem differently. At the same time, amidst their subliminal problems, I appreciate how the director took time to highlight moments when the couple noticed the little things their other half do for them. Tiffany Yong: What surprised me was the finale confession song, a slightly crude song which made some laughed, and made me cried my eyes out. It was undeniable that the veteran actors were great, for all it took was a simple line, a quick glance and the audience could get the message immediately. If you are in a relationship, this is a great opportunity to watch the movie with your partner and discuss how you would have reacted to the events. And no, you won’t have to catch the first two to understand this film, as it’s super relatable, but watching them will probably make you appreciate the movie so much more! The film uses and cast fans of the series as extras. The director wanted to give everyone a chance at a reunion for the third film, and decided to put together Cherie-Jimmy Fan Club for the fans to join the shoot. Pang received applications from fans in China, Taiwan and as far as Malaysia. These fans even traveled to the set on their own dime just to appear in a single scene. Organizing this took longer than just hiring extras, but it created a wonderful memory for everyone. Miriam Yeung was excited at the opportunity of working with Paul Chun because he also played her father in her first television series as lead actress. This film’s style requires everyone to act naturalistic in front of the camera, but the script doesn’t go into Cherie’s relationship with her father. I was worried that I wouldn’t know how to act it out. Once I learned that Paul is playing my father, it felt like a long overdue reunion after spending many years away. Love Off the Cuff is the third instalment, with Love in a Puff and Love in the Buff being the first and second. Like the previous two, the film begins with a frightening prologue. This is the first time that the trio has worked with the same characters three times. Check out Love Off The Cuff (春娇救志明) Facebook Page! 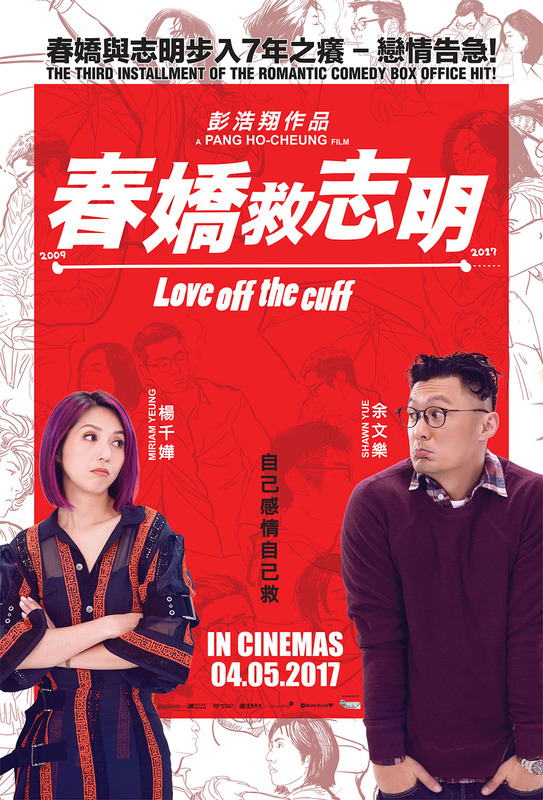 Love Off The Cuff (春娇救志明) is out in cinemas on 4 May 2017. Extras ate a typical occurrence in American films and I like the addition here. This sounds like a fun, light movie. Looks like a nice feel good romance movie. I like the casual, lazy, laid back styling of the lead actors. These Hongkong ad Korean movies are so popular in Singapore. This looks quite a nice movie to watch. This looks like a really good watch and it shows with several installments already. I’d check this out if it’s available here. I like it, mature, some explicitness, and comedy. What I don’t like about Rom-Coms is the plot, first part is the fun part, second is the drama part, then a happily ever after OR a sad realization. If I ever watch this movie, I hope it gives me a different insight on romcoms. It must be so fun for the fans to be extras in the film. I wonder if they also were paid with some talent fee. I think they’d gladly accept the extra role even without. Thanks for introducing me the world of Hong Kong movies. One has known only Bollywood and Hollywood. I like the way you review the movie, looking at all aspects.